Where to start celebrating fifty years of a marriage? Here, a daughter-in-law assembled the family and the nucleus of friends – some of whom were in the original bridal party. The stunning location around the garden and pool served admirably for the casually arranged portraits of the grandparents, their two sons and their families. 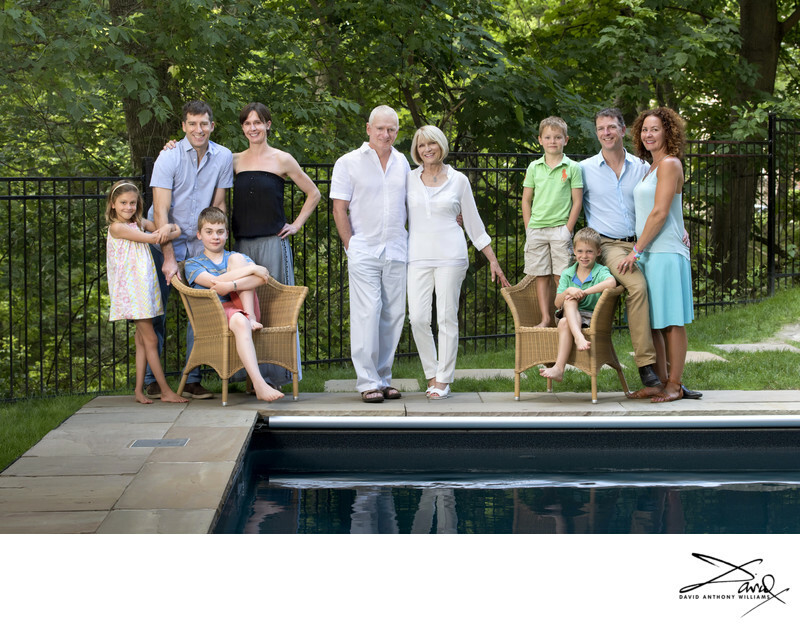 By sitting some people, standing others and leaning one or two – I was able to make a connected arrangement that defined each family group within the structure of the image. It was important to have the two ‘stars’ of the show standing at the center of the group. The tendency can be to sit older people which can diminish them if the posing is not done well. A family portrait like this is sadly a rarity for many families. It’s put off for too long, or left to a quick capture on someone’s iphone. Your family is worth more attention than that. Location: Beaches Toronto Ontario Canada. 1/125; f/6.3; ISO 400; 82.0 mm.